At Amherstview Care & Cure, we do more than dispense medicine. Filling your prescriptions is just the beginning – we do a lot more, including dispensing friendly, professional advice and services! We know your medication will only work if you take it properly, so we have designed a number of ways to help make sure you do just that. MedsCheck: Make sure the medications you’re taking are working together for your greater good. The MedsCheck service was created specifically for people who are taking three or more medications at a time. It’s vital that the medications you’re taking are compatible with each other if they’re going to work the way they were meant to – namely, to improve your quality of life. A MedsCheck provides an opportunity for you to sit down one-on-one with your Amherstview Care & Cure Family Pharmacist to help identify and resolve common medication-related issues so you can get the most benefit from your medication. This medication review can help you better understand your medication therapy and ensure that medications are being taken as prescribed. FlavoRx may be the difference between compliance and resistance. Let’s face it, unless specifically formulated for children, medicine usually tastes like, well, medicine. However, family doctor’s still prescribe a wide variety of medications for children and teens that aren’t specially flavoured for easier compliance. And even though as adults, we’re just supposed to brace ourselves and “take our medicine,” in reality it’s not always that easy – not when every spoonful makes you wince. Enter Amherstview Care & Cure FlavoRx. We provide that added touch of flavour to help the medicine go down – no matter how old you are. Different flavours can improve compliance in cases where a disease condition alters taste perception. Investing in a healthy heart doesn’t have to be complicated. At Amherstview Care & Cure, we offer one-to-one consultation and advice to answer all of your questions, concerns and matters of your heart health. High blood pressure is one of the main risk factors for heart disease, stroke and kidney failure. Small changes in pressure can have a significant impact on life expectancy, so it is important for you to monitor your blood pressure and keep it under control. Be Smart! Track your Blood Pressure! A small amount of normal fluctuation in blood pressure occurs during different times of the day. Your heart health is vital, so it’s important to stay on top of it. A simple and easy way to test yourself is to use our blood pressure kiosk. Our Blood Pressure Check card lets you store up to 30 readings and you can get an average of your last 10 results every time. Since your blood pressure fluctuates during the day, this average will give you a more accurate reading. Its a better way to manage your heart health. The Amherstview Care & Cure Blood Pressure Check card gives you more reliable results for you and your health care provider to make decisions. Quick, convenient and easy to use, we encourage you to use your card as often as possible at your local Amherstview Care & Cure location. Our pharmacy staff is at your service and will be happy to review your blood pressure information at your request. Ask your Amherstview Care & Cure Family Pharmacist about obtaining your own personal Amherstview Care & Cure Blood Pressure Check Card. Take advantage of Specialty Compounding when off-the-shelf just won’t do. There are times when your family doctor or another health practitioner will prescribe something that doesn’t come straight off the pharmacy shelf. When that happens, your neighbourhood Amherstview Care & Cure Family Pharmacist turns to his or her roots – as a skilled apothecary. Before the creation of the modern pharmaceutical system, doctors would hand their patient a handwritten prescription that consisted of a list of medicinal ingredients that needed to be combined in exactly the proper amounts. The patient would then visit the nearest retail shop with a skilled apothecary who would take the list of herbs, chemicals and other ingredients and combine them just so in order to produce the necessary medication. Your Amherstview Care & Cure Family Pharmacist is also a skilled apothecary. So if your healthcare practitioner prescribes a remedy that needs special preparation, visit your neighbourhood Rexall Family pharmacy and we’ll be happy to prepare it for you. Need a Amherstview Care & Cure Family Pharmacist who can prepare a specialty medication for you or your family member? Available at selected stores. See in store for details. Amherstview Care & Cure Compliance Packaging: Get the help you need to keep your wellness on track. You know those over the counter medicines that come in a sheet where you pop the medication out through the tinfoil backing? That’s a compliance package. Amherstview Care & Cure has taken that idea and made it into an incredibly helpful memory tool – which is especially important if you have to take several medications or even the same medication several times a day, every other day or at very specific times. Each medication contained within the Rexall™ Compliance Packaging is labeled with its description and directions for use. Amherstview Care & Cure will create a blister pack tailored to your prescription regimen. Each medication is placed in the Compliance Packaging so that dosing occurs at the same time of day for best results from your medication. It’s helpful to you and especially helpful if you have a caregiver. And it’s just another important service from your neighborhood Amherstview Care & Cure pharmacy. A blood clot is a mass of blood cells and blood components that form when a blood vessel is injured. Blood clots help stop bleeding after an injury and serve a valuable function in wound healing. It is normal and necessary for blood to clot. For example, when you cut your finger, your blood will begin to clot to stop your finger from bleeding. Normal blood clots are rarely dangerous on their own. As part of the body’s natural healing mechanism, clots that have formed for whatever reason are usually broken down and reabsorbed by the body. Why are Blood Clots a Serious Problem? Abnormal blood clots that form within arteries and veins can block the normal flow of blood through the blood vessel, preventing blood and oxygen from reaching important organs and tissues. Blood clots can also break off from where they are formed, travel through the bloodstream and block blood vessels in other parts of the body. Unnecessary blood clotting and blockage of blood flow can lead to serious and sometimes dangerous problems. If blood flow to the legs is decreased or blocked (known as a deep vein thrombosis or DVT), you may experience pain and swelling in your leg. If blood flow to the lungs is decreased or blocked (known as a pulmonary embolism), you may experience shortness of breath and sharp chest pain. If blood flow to the heart muscle is decreased or blocked, you may experience chest pain or a heart attack. If blood flow to the brain is decreased or blocked, you may experience a stroke. Who is at Risk for Developing Unwanted Blood Clots? A variety of medical problems or conditions can cause unwanted blood clots to form. Dangerous blood clots can form after surgery or in response to traumatic injury, such as car accidents. Additional medical problems or conditions that can increase your risk of developing unwanted blood clots include atrial fibrillation (a type of irregular heart beat), heart disease, cancer and having a mechanical heart valve. The Amherstview Care & Cure Resource – Clot Control, a comprehensive booklet filled with useful information to help you prevent blood clots and manage your warfarin therapy. If you have questions about warfarin, Clot Control has the answers. The Amherstview Care & Cure Record – Warfarin, a journal in which you can record your warfarin doses, the results from your blood tests (INR results) and INR testing schedule. Please bring your Amherstview Care & Cure Record – Warfarin each time you visit the pharmacy during the program. Information at each refill on how to get the most out of your medication and how to take control of your health. Please contact Amherstview Care & Cure for further information. 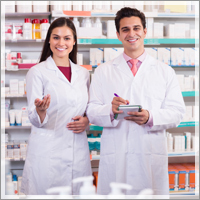 Our team of dedicated pharmacists would be glad to speak with you.